Evelyne Vintage Antique Coffee Bean Mill Windmill Wheel Hand Crank Manual Grinder Wooden Drawer - A charming grafted vintage manual burr mill coffee grinder for creating a good brew the old fashion way. The fully adjustable ceramic burr will mill coffee bean into the desire fineness to meet your utmost standard. Solid high quality mechanism is durable and can withstand heavy duty use and beautifully finished wood base come with drawer to catch the grounded coffee. A great gift idea for house warming, coffee enthusiast. 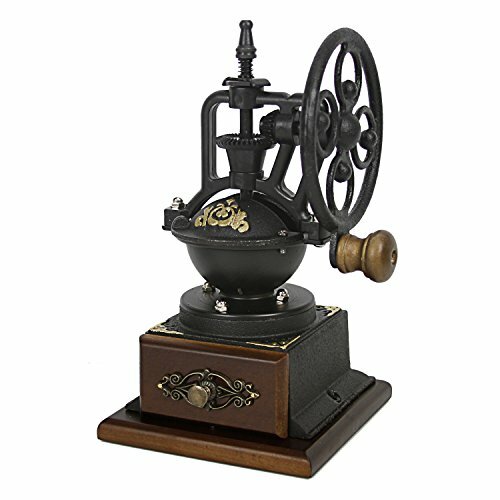 Classic vintage style manual hand crank coffee bean grinder, charming recreate antique ambiance for your home kitchen. The corrosion resistant ceramic burr is fully adjustable and easy operate, yielding desire fineness to meet your standard. High quality windmill wheel crank mechanism is strong and solid for heavy duty use. Beautifully finished wood base come with drawer to catch the grounded coffee. Besides functionality, this grinder can double as decorative piece that add ambiance to surrounding space and perfect as house warming gift. Dimension approx: 10" x 5.25" x 5.25"
If you have any questions about this product by Evelyne, contact us by completing and submitting the form below. If you are looking for a specif part number, please include it with your message.